Orange Order parades have begun peacefully, the BBC reports. The Irish Times reports that the Police Service of Northern Ireland is deploying 3,500 officers, with about one third deployed to north Belfast hot spots. After several years of relative calm, loyalist violence erupted last July when Orangemen were banned by the Parades Commission from returning home past the Ardoyne shops. The commission decision was upheld this year. Here’s a good background piece about “Orangeism,” also from the BBC. By the way, that “L.O.L” on their banners refers to Loyal Orange Lodge, not laughing out loud. This entry was posted in Northern Ireland, Religion and tagged Belfast, Orange Order on July 12, 2014 by admin. 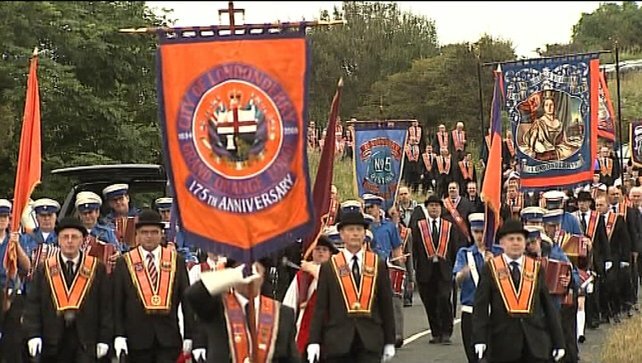 It’s July, and that means Orange parade season in Northern Ireland. The trouble has already begun as the two main unionist parties walked out of talks at Stormont after the Parades Commission banned Orangemen from marching by a republican area of north Belfast on 12 July. The Guardian reports there are renewed fears that serious street disorder will break out in the coming days over the ban. Here’s the full statement from five unionist leaders, including Northern Ireland First Minister Peter Robinson. We will see what happens, but in Northern Ireland in July, it usually isn’t anything good. An Orange Order parade. Image from rte.ie. This entry was posted in Northern Ireland, Politics and tagged Belfast, Orange Order, Peter Robinson, Therese Villiers on July 3, 2014 by admin.